he's all about every new Purdue commit on twitter, welcoming them and all that stuff. he's also still "open to Michigan" and they're still going after him hard. so who the hell knows. anyone know if aj hammons is playing summer league or what he's doing? Purdue currently has the #22 ranked class in 2019. That's pretty good. Better than Wisconsin Nebraska, Florida, USC, TCU. Minnesota . Brohm is doing amazing right now. here's something i just thought of: doesn't Myles have the same game as Jujauan Johnson did? Except JJ was even stringier than Myles? What do you guys know about Trayce Jackson-Davis ? He's narrowed his choices to 6 teams in basketball. Purdue, IU, MSU, UCLA, Wake Forest and Iowa. I dont know much about him at all. Dale Davis' biological son. 6'9", probably around 220 to 230, super athletic. Real good finisher around the basket. Excellent shot blocker. Can handle the ball and pass, although he's a bit undisciplined in both areas. Near the end of last season, he started to really assert himself more and dominate games. Has a chance to develop an outside shot, but didn't really shoot many last season. Somewhat foul prone. Below average free throw shooter. Did have a tendency to float in and out of games. Unless something crazy happens, he will be Mr. Basketball in Indiana for 2019. His high school team, Center Grove, a southern suburb of Indianapolis, has a good chance of winning a state title this season. EDIT: Another thing about him too is he's improved dramatically the last two years. After his freshman year, he was outside the top 100 to 150 in his class, and now he's top 15. He's getting better and better. Last edited by shags; 08-05-2018, 03:56 PM. of the 6 we're the only one not getting an official visit from TJD. you can spin it on that we were one of, maybe the, first big programs on him so he's already been to campus plenty (and he has). but it's not gonna happen, he's like 95% IU. 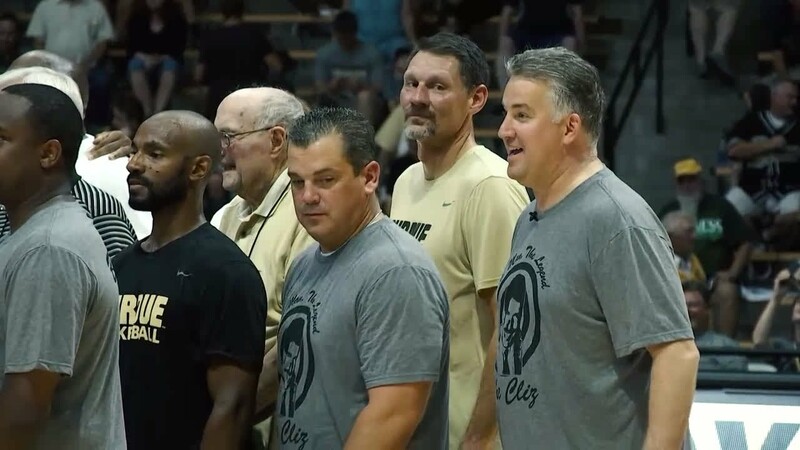 Mic'd Up with Coach Painter at the 2018 Alumni Game.